India's Narendra Modi is now delivering a speech at SPIEF. Job creation is a big central theme of Donald Trump's presidency. 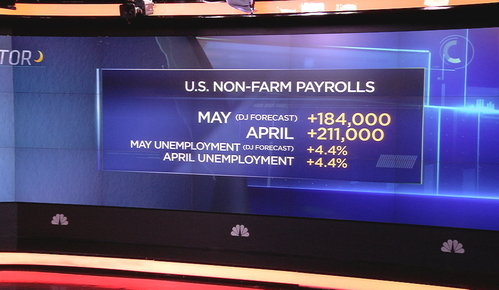 Today the big number is the U.S. nonfarm payrolls. April's figure was 211,000 and Dow Jones forecasts 184,000 was added in May. That number is released in two minutes time! 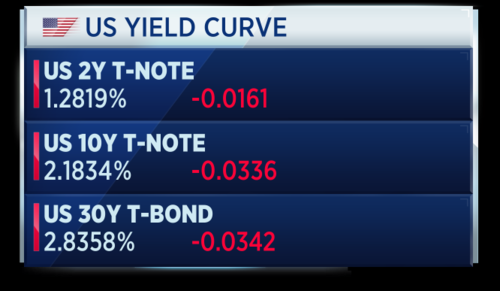 U.S Treasury yields dip on the the nonfarm payrolls results. The benchmark 10-year note yield broke below 2.2 percent. 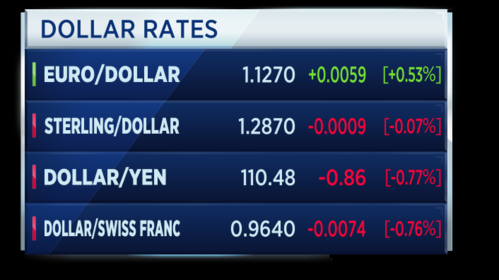 The dollar is dropping sharply against several major currencies (expect sterling, it's flat against the U.K. currency) following the jobs report. Against the Swiss franc, the dollar drops to a 7-month low. 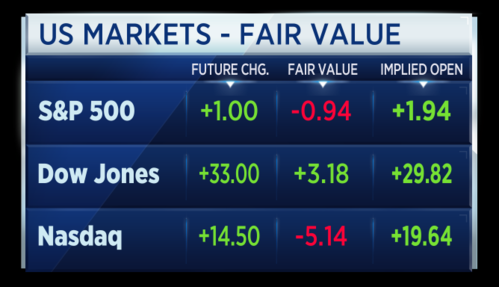 U.S. stock market futures have pared back, although are still called to open higher according to future values. 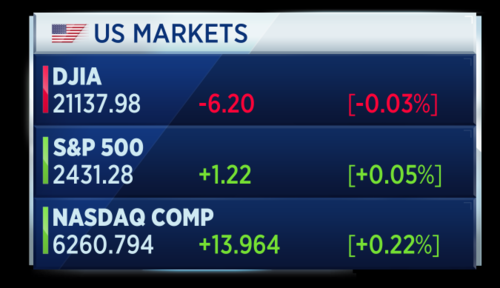 The Dow and Nasdaq are called about 0.1 percent higher, the S&P 500 is roughly flat. Meanwhile, the shares of big U.S. banks turn negative in premarket trade. Bank of America, JP Morgan and Wells Fargo shares are trading down by 1 percent or more. 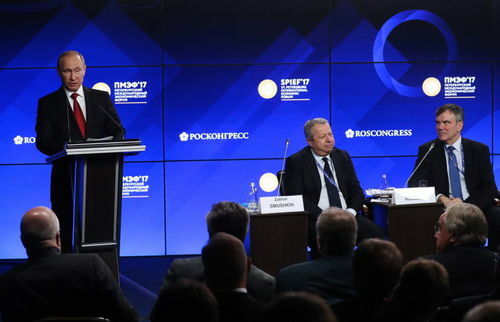 Russian President Vladimir Putin is speaking at the St. Petersburg International Economic Forum, taking part in a plenary session, which will be hosted by NBC News Anchor Megyn Kelly, along with leading global figures including India's Prime Minister, Austria's Federal Chancellor, and the President of the Republic of Moldova. Here are some of highlights from the session so far. Putin says the Paris climate deal is a good document, which does not contain mandatory requirements. He says Russia has not ratified the deal because they are waiting for clarity on some rules and have questions which need to be answered, adding the world has time to reach agreement on the accord. He says he does not judge Trump for pulling the U.S. out of the agreement, and instead tells the business community "Don't worry, be happy." On NATO, he says it is an instrument of U.S. foreign policy and says Russia is worried as it sees NATO's military infrastructure getting closer to its borders. However, he says the country needs to cooperate with NATO members against terrorism. U.S. markets are now open for trade. The major indexes closed yesterday's session around record highs. The Dow and S&P are flat, while the Nasdaq opens higher. 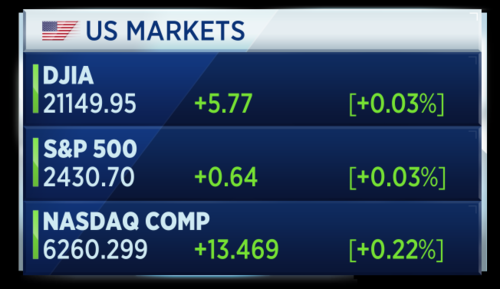 The S&P and Nasdaq have hit record intraday highs. Here's a look at the best and worst performers on the S&P 500. Financial stocks like Bank of America are down sharply because of the disappointing payroll number which may delay a Fed rate hike. Gary Cohn, chief economic advisor to President Donald Trump and Director of the National Economic Council, says he is not concerned by the slowing rate of job growth in the U.S. economy. He says he is confident the debt ceiling will be raised by Congress later this year. U.S. stock markets have hit record intraday highs in Friday's session. The U.S. nonfarm payroll figure for May came in well under expectations at 138,000, causing the dollar to drop and bond yields to rise. The figures for the two previous months were revised down by 66,000. But this report won't dissuade the Federal Reserve from hiking interest rates at its next policy meeting, says Sal Guatieri, senior economist and director of economic research at BMO Capital Markets. Given the groundswell support from Fed officials for a June 14 rate hike, and signs that consumer spending is picking up, the soft May jobs report should not dissuade the FOMC from lifting rates for a fourth time this cycle. Of course, a further slowing in employment that leads to a backup in the jobless rate would be a game-changer. However, for now, we suspect that most of the slowing reflects increased difficulty finding qualified workers. Companies are now creating jobs faster than they can fill them, while labour force growth has declined to 0.8% y/y from a recent peak of 1.9% last fall. This means the Fed should heed to the tried-and-true normalization path, or risk facing a resurgence of inflation down the road. Education and health created the most jobs, with 47,000. Retail shed 6,000 jobs, and the government dropped 9,000 jobs. Sal says retail has cut jobs for four consecutive months. Online competition has led to more bankruptcies in the sector, while advanced automation is culling the ranks of bricks-and-mortar cashiers and salespersons. Jim O'Sullivan, chief U.S. economist at High Frequency Economics, agreed the Fed will not be affected by the report. We believe the trend in employment growth remains more than strong enough to keep unemployment trending down, and that the trend in wage gains is upward. Jobless claims continue to show no sign of an uptrend. We expect Fed officials will generally also dismiss the weakness as mainly due to volatility; we still expect a rate hike on June 14. Along with the payrolls data, we also had the U.S. trade deficit for April, which widened to $47.6 billion from $45.3 billion in March. This was well above consensus expectations of $46.5 billion. Jim O'Sullivan, chief U.S. economist, explains shares thoughts on the data. The deficit was a bit higher than expected based on the advance report on the goods portion. The real goods deficit was $63.5B in April, up from $60.7B in March and $62.2B, on average, in Q1. If sustained in May/June, the April level would result in net exports subtracting about 0.5 pts from the real GDP growth rate in Q2. That is slightly more than the 0.2 pts allowed for in our 3.0 percent estimate for the Q2 growth rate, although this week's consumer spending data were a bit stronger than expected. 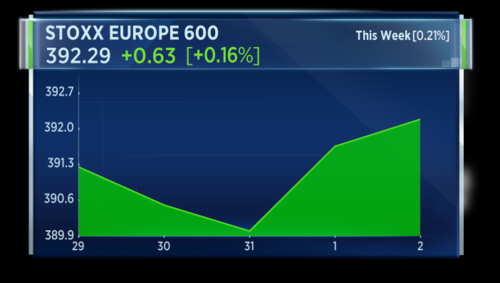 Just over half an hour until the close of European markets and the STOXX 600 is up 0.23 percent. 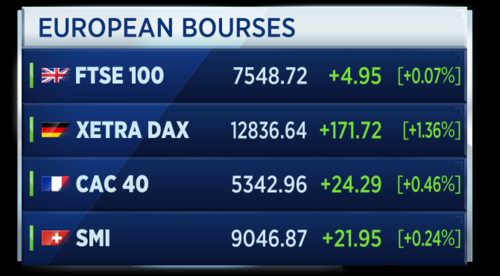 Here's a look at how the major European bourses are looking. U.S. nonfarm payrolls data disappointed when it was released earlier today. 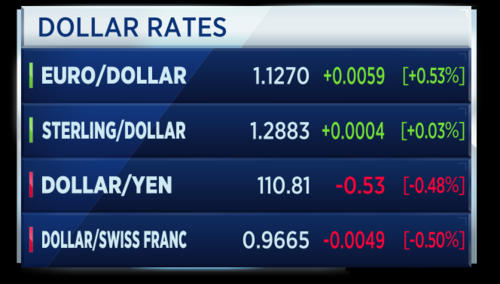 The dollar slipped to multi-month lows against the euro and Swiss franc, and a two-week low against the yen. However, market concerns that the Fed will be put off hiking rates by the report are unfounded, according to several analysts. Brian Davidson, economist at Fathom Consulting, says a June rate hike is still on the cards. These figures, coupled with average hourly earnings which grew just 2.5 percent in the twelve months to May, may prompt the doves on the FOMC to reconsider voting for a rate increase later this month. But with the jobless rate falling to 4.3 percent, and other data from today's report pointing to diminishing labour market slack, we still expect the Fed to pull the trigger this month. After all, many FOMC officials have suggested publicly that they still expect another two 25 basis point increases in the fed funds rate this year and view the recent decline in inflation as transitory. Darren Ruane, head of fixed interest at Investec Wealth & Investment, echoed these thoughts. Despite the disappointing economic news, the big picture remains that the unemployment rate is close to normal cycle lows and the likelihood of a U.S. interest rate rise later this month has not diminished. Fed policymakers will likely focus on the second round effects of a tight labour market and may ignore today’s data as short-term economic noise. 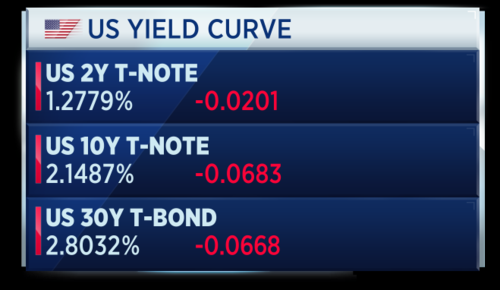 U.S. Treasury yields extend their losses, with the 10-year and 30-year yield dropping 6 basis points. The 7-year yield is at a 6 month low. Bond markets were disappointed by the payrolls data, which came in much lower than expected. European markets are now closed. The STOXX 600 finished the session marginally higher, up by 0.16 percent. The index has finished the week up 0.21 percent. Here's how the individual European bourses performed on Friday. The U.K.'s FTSE 100 pared gains after the U.S. nonfarm payrolls data was released. The index finished the session flat. Meanwhile, the German DAX climbed to a fresh record high earlier in the session, rising 1.4 percent. It finished the session up 1.24 percent. Chemicals, autos and industrials led the Stoxx 600 higher today, while oil & gas and utilities dragged. Let's take a look at the shares which finished the session at the top and bottom of the index. We'll close the blog there. Join us on Monday for more market action as we build up to the U.K. general election at the end of the week. There'll also be the latest economic forecast updates from the World Bank and OECD, the latest meeting of the European Central Bank and U.S. ex-FBI Director James Comey will be testifying before the Senate Intelligence Committee on Thursday.